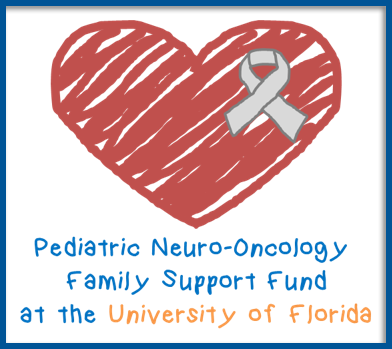 At the University of Florida, we have specialists to treat craniopharyngioma in both adult and pediatric patients. Craniopharyngioma is a benign brain tumor most commonly occurring in the suprasellar area of the brain. This is the area of the brain near the pituitary gland and optic nerves. Craniopharyngiomas are epithelial tumors that arise along the path of the craniopharyngeal duct. They account for 2.5% of all primary intracranial neoplasms. Craniopharygiomas occur in a bimodal age distribution, with the first peak occurring in childhood and early adolescence, predominately at age 5-10 years. The second peak occurs atage 40-60 years. These tumors occur equally in men and women. The clinical presentation of craniopharyngiomas includes visual loss, endocrinologic disturbances, and headache. Most patients will complain of visual loss in both peripheral fields. This is known as “bitemporal hemianopsia,” and is a result of the tumor pressing on the optic chiasm (a structure where the two optic nerves cross). As the tumor enlarges it can lead to blindness in one or both eyes. Headaches are common and may be bifrontal or frontotemporal. If there is significant obstruction of the normal CSF pathways, the headache can be accompanied by nausea and vomiting. 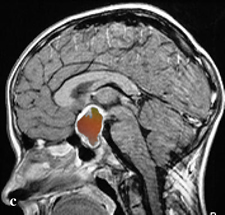 Because of the proximity of the tumor to the pituitary gland and hypothalamus (the brain structures which regulate bodily endocrine function) many patients will have signs or symptoms of endocrine dysfunction, including growth failure, altered body weight, menstrual irregularity, decreased libido, hypothyroidism, or delayed or precocious puberty. The definitive diagnosis of craniopharyngioma is made by neuroimaging studies, such as CT and MRI scans of the brain. CT scan will reveal a calcified tumor in the sellar-suprasellar areas. MRI with and without contrast will show the full extent of the tumor and its involvement with adjacent brain. Opthalmological examinations, especially visual field testing and fundoscopic examinations, help determine the degree of visual loss. The first step in treatment is surgery. Surgery provides tissue for diagnosis and relieves any pressure on the brain caused by the tumor. Surgery alone may be curative if the entire tumor can be safely removed. A variety of surgical approaches (subfrontal, pterional, transphenoidal, tranventricular) may be used depending on the size and location of the tumor. When complete excision of craniopharyngioma is not possible, surgery is usually followed by radiation therapy. A typical course of radiation therapy would involve daily treatments, Monday through Friday, for five or six weeks. Radiation therapy following surgery results in a high long term cure rate. When there are significant endocrinological disturbances caused by the tumor or surgery, specific hormones may need to be replaced, with such medicines as DDAVP, thyroid hormone, and steroids. This is usually managed with help from the medical endocrinology service.